In July 2012, the Centers for Disease Control published an article about injuries resulting from the ingestion of wire bristles from grill brushes. The story was reported widely in the press at the time and caused quite a bit of concern about the safety of grill brushes, and rightly so, since wires can become lodged in the throat or intestines and cause severe pain. It’s important to check the condition of your grill brush often. If bristles are coming off the brush head, or you’re finding stray bristles inside the grill, it’s time for a new brush. It’s common to not notice anything until you clean-out the inside of your grill and find the bottom filled with little pieces of wire. Also, after preheating the grill and brushing the grates, spend a few seconds examining the grates. If you find stray bristles on the surface, carefully remove them before placing food on the grill…and then toss that old brush in the trash! Just to be safe, Weber recommends that you replace your grill brush each spring to avoid any problems. 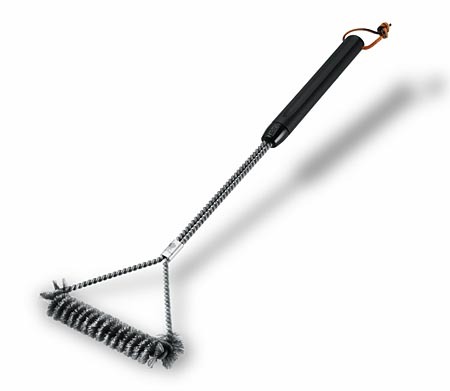 The Weber 6493 21″ 3-Sided Grill Brush is one of the best and is highly recommended by members of The Virtual Weber Bulletin Board.